The increasing demand for using alternative sources of energy is giving rise to gadgets and appliances that run on solar power. It mainly refers to devices that run on energy from the sun, i.e. solar energy. One such innovation of modern times is a solar inverter with battery. Such inverters change the direct current (DC) into alternative current (AC) using solar power. • It runs on natural solar energy obtainable from the sun. • It is clean and pollution-free. • Saves your money and conserves energy. • Decreasing the greenhouse effect and global warming. • Off Grid: The off-grid inverters work independently. The solar inverter uses remote systems, i.e. they run on the DC power from a battery panel. It is these battery panels that charge from solar panels. • On Grid: These inverters are dependent on the grid. They get power from the electricity grid corresponding to the phase and frequency. A solar inverter converts the electrical energy with photovoltaic cells. This energy gets stored in the battery during the daytime for later use. So, the intent of this solar inverter with battery is to use solar energy to run appliances and gadgets at home in the event of a power cut. However, if there are prolonged power cuts in your area, then you can get hybrid inverters. It refers to those inverters that can run on solar and normal power. There are inverters which you can use as normal and solar inverters. They feed energy from solar panels and battery. If you want to maximize the use of a solar inverter, then get a solar battery with it. With such a solar energy system in your home, you can store the extra energy from the solar panels produced at home. You can use this stored energy in the battery when you need more electricity other than that generated from solar panels or during a power cut at night. Solar Inverter: It should be a simple and safe one to use in commercial and home set-up. Besides, its display should be such that it is easy for a layman to comprehend. If it is cost-effective and comes with the latest technologies and design, then it can take care of sudden electricity woes for many years. Solar Battery: It should work with or without solar setup and should be designed in a manner that can support long and frequent power cuts. Further, it should demand low maintenance and have fast-charging capabilities. If it is resistant to corrosion, then it can accompany your solar inverter for a long time. 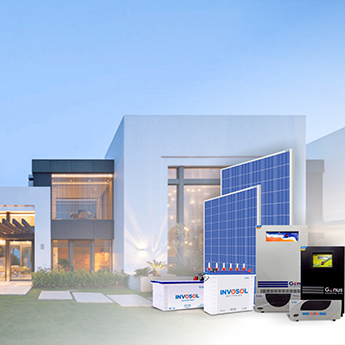 How to Choose The Best Inverter for Home Needs?